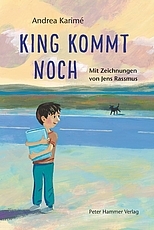 We are delighted to announce that King Will Join Us Later by Andrea Karimé and Jens Rassmus has won the Children’s Book Prize NRW 2018! From the ministry’s message: “Reading pleasure is a pleasure that should not be withheld from any child. Inspiring stories and attractively designed books that are suitable for reading aloud and at the same time challenge you to read yourself are indispensable for this. With the children’s book award, we repeatedly move such a book into focus, “said Culture Secretary Klaus Kaiser. In King Will Join Us Later, the emotional theme of a loss is told: the loss of the dog King back at home, the home which the family of the nameless first-person narrator was forced to leave.